Bringing Jose Reyes back to the Mets looks and smells like a Jeff Wilpon move. Let’s look at the move from several perspectives, beginning with the 33-year-old shortstop who must now become a utilityman. Reyes’ production — offensively and defensively — has fallen off dramatically since winning the NL batting crown in 2011, his last year as a Met. That’s not entirely surprising, considering that he’s now in his early to mid-30s, a time when most men who aren’t idiots (i.e., Marlon Byrd) tend to lose some of their physical prowess. The formerly electric ballplayer is now a battery powered version, as his speed, defense, hitting, and power have all degraded over time. With his lack of production overall combined with an arrest for domestic abuse hanging like a black cloud over him, this is likely Jose Reyes’ last shot at salvaging an MLB career. With everything against him, the very best place Reyes can take that last shot is in Flushing with the Mets. It’s a place where the fans loved him, he had great success and comfort, and it’s very close to his humble $5M home in Old Brookville (just a stone’s throw from where I work … heck, maybe I can hit to him some ground balls!). Playing for the Mets is the very best situation at this point in time for Jose Reyes. 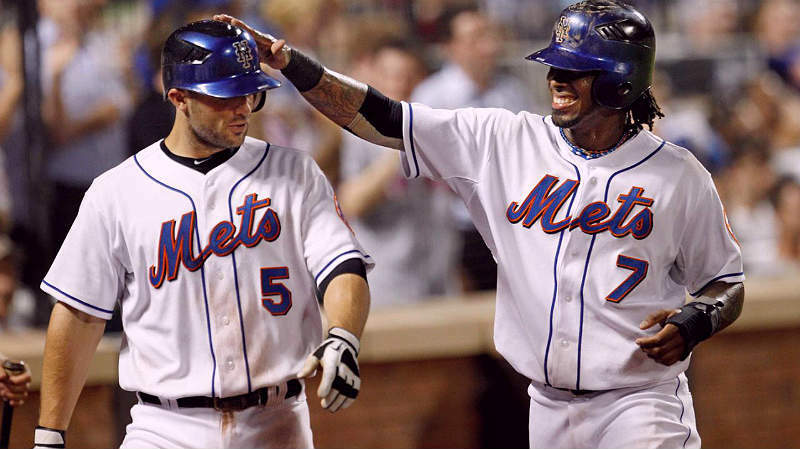 However, is adding Jose Reyes to the w25-man roster the very best situation at this time for the New York Mets? For fans who remember the 2003-2011 version of Reyes, it’s a no-brainer. THAT Reyes was spectacular, arguably one of the top ten players in baseball in his prime, at the very least, one of the most exciting. Considering the 2016 Mets’ anemic offense and inability to score without hitting a homerun, the Jose Reyes we all remember is a welcome addition — the leadoff hitter and sparkplug speedster the team is so sorely lacking. Which brings us to Sandy Alderson’s perspective: Alderson did not want to extend Reyes prior to the 2010 season — when he could have had him at a discount — he did not want him after winning the batting title, and he certainly doesn’t want him on the club now. Reyes doesn’t fit the Alderson mold of homerun bat and on-base percentage (see: Curtis Granderson). Alderson does not value stolen bases, one of Reyes’ few remaining strengths and possibly the only sure thing he can bring to the table. Reyes was not an “Alderson guy” when he was a superstar, so do you think for a minute he’d be coveted now, with diminished skills and questionable character? But, you have to consider the perspective of Alderson’s boss Jeff Wilpon. Like his dad, Jeff is nostalgic, and believes he can bring magic back from the past. He also believes in giving people second chances. And he likes the turnstiles turning and the cash registers singing. Put that all together, and it makes perfect sense to bring back Jose Reyes. In Jeff Wilpon’s mind, Reyes will be a public relations shot in the arm — particularly now, with so much negativity surrounding the club due to the team’s struggles in the standings and the frightening streak of arm issues suffered by seemingly the entire starting rotation. After looking at this from the perspectives of Reyes, Alderson, Wilpon, and Mets fans, what about the Mets’ 25-man roster? Can Reyes make a positive impact on the current club? Over the short term, I think he can — mainly because I believe Reyes will be playing with desperation. If he wants to continue playing MLB, he can’t mess up this opportunity, so I see him playing a rejuvenated brand of ball not seen since he entered his thirties. For a brief period of time — maybe two weeks, maybe a month, maybe a little longer — I see him hitting the ball to all fields, showing discipline and focus to take walks, running the bases wild, hustling like there’s no tomorrow, and making diving plays at the hot corner. And maybe that temporary show will be enough to spark the Mets offense, creating a dynamic they can run with through the end of the season. Eventually, though, Reyes’ 33-year-old body won’t be able to sustain that level of play. And though he may rack up “web gems” at third base, they may not make up for his inexperience at the position and diminished range. Teams may start bunting to expose a potential flaw, for example. Reyes may not have the reactions to handle the hot shots. He may not be sure what to do with the ball in some situations, or he may screw up relays from the outfield. Little things that similarly made Daniel Murphy a burden on defense, despite the occasional highlight-reel play. Before that, though, there is the consideration of Reyes fitting the Mets roster — on the field and in the clubhouse. Something that struck me is that there is not one player on the Mets active 25-man roster who played with Reyes as a Met. Lucas Duda and David Wright are the only former Mets teammates of Reyes on the 40-man, and both are on the DL (BTW, remember when we compared the durability of Wright vs. Reyes?). Crazy, right? So the idea that Reyes’ former teammates will be excited to be with him again, and he’ll feel comfort having old friends around, is mostly out the window. It’s a different dynamic from when Reyes left in 2011. Wright won’t be around to answer the tough questions of the press while Reyes hides in the trainer’s room with Carlos Delgado or Carlos Beltran — and there WILL be microphones chasing Reyes before and after every game, particularly in the first week or so. On the field, it may be easy to say, “hey, a speedster is exactly what this station-to-station team needs!” But is it? Sandy Alderson has carefully constructed the club to operate this way. Clearly, inside the front office there is agreement with the SABR community that stolen bases are not constructive and not worth the risk. Terry Collins will want to bat Reyes leadoff, but Alderson prefers the higher OBP and start-the-game-with-a-solo-homer feature that Curtis Granderson offers. Considering that Reyes’ offensive strength is to be a table-setter, will he have much value batting in the bottom third of the lineup? Sure, he’ll be happy to bat anywhere in the first few weeks, but will Reyes pout if he’s still batting 8th as the “second leadoff guy” a month later? Further, will he be and remain productive as a part-time player — which very well may be his role? Honestly, I’m not sure how this will play out. On the one hand, with the Mets struggling so mightily offensively, and in need of some potentially positive news, signing him to a minor-league contract was low-risk. However, if he appears healthy and showing energy in Brooklyn, he’s joining the 25-man roster with a week or two. That’s why I doubt Sandy Alderson wanted to sign Reyes — this was a Wilpon-driven move. Whether or not it works out for the Mets benefit is not necessarily the point. Rather, it brings into question who is really running the club. What do you think? Was it a good move for the Mets to bring back Jose Reyes? Why or why not? And yes, I’m aware that I mostly avoided the elephant in the room — the domestic abuse charge and all that comes with it — so please feel free to sound off on that issue as well. Back Do the Mets need to try less situational hitting? Next Is this 2016 or 2012? Dont agree with your conspiracy theory. Its pretty obvious that Alderson has been at the helm since he took over, and its ok to suspect that jeffy Boy is noseing around, but the reyes signing makes sense. He was great, he wants a chance, he’s cheap and doesnt cost a player, its a one year deal and he’s most likely better than ty kelly and starting infield for that matter (but leave that out) and by competición, he might make everyone better. Im starting to think twice about this. I still think it was a no brainer to pick him up for the league mínimum but why bring him up before he earns it, right when Wilmer is on a tear and as a starter instead as utility. I típ my hat to you Joe, this has jefffy ticket sales written all over it!! I think it’s a little from Column A and a little from Column B. In the past few years, the Mets (one assumes this is Alderson) refused to part with any young arms for some help at the major league level. A recent Newsday article indicates they are similarly disinclined to trade Amed Rosario. The FO is likely hoping to wait out the injuries and the slumps in the hopes of a late season push. This reminds me a bit of the Lenny Randle situation back in 1977. Randle punched out his manager, getting a quick exit from the Texas Rangers. The Mets picked him up and he slashed 304/383/404 for them in 136 games, including 33 steals. Granted Randle was 5 years younger than Jose is now, but I think most of us would sign up for that type of production from Reyes. Randle played his heart out for what was a terrible Mets team and as a result, he was able to extend his career by another five years, mostly with Seattle. As an aside, I attended a Mets/Phils game early in the 1978 season with the high school band and got Lenny to sign a scorecard. One of the nuns along said I should tear it up for what he did to his manager (ex-Phillie Frank Lucceshi). Ah, the mentors I had in my youth! Wasn’t it Wilpon that pushed for the Cepedes trade last year? Why is hard to believe that he is behind this, especially since Alderson already said Reyes was not a good fit? Sounds plausible to me, Joe. Whatever Alderson is, he does not seem to be a guy who does a total 180 after 3 games. I’m guessing that different people told the press “no interest in Jose” on June 16 and “definite interest in Jose” on June 19. Which was Alderson and which was Wilpon, I don’t know. After the Leigh Castergine mess, Wilpon might have assumed “stay away from all domestic issues” was the right approach. “No interest in Jose” might have been an attempt to appear principled before thinking through whether the Mets actually might or might not want Reyes for baseball reasons. Three losses to a last place team later, a note from Alderson about how Reyes might help the team, and boom, Jeffy recants. Or it could be just the opposite. Maybe “no interest in Jose” was Alderson’s reasoned consideration that Reyes’s likely production wasn’t enough to warrant the P.R. hit from employing a domestic abuser, and Wilpon overruled him. Whether that would have been clueless or sexist or calculated, I shudder to think. As far as what Reyes may contribute, I have no idea. I think it depends entirely on the health of his legs. If he’s spent his entire suspension stretching and doing track workouts, maybe he can return to who he was 2 or 3 years ago. I think his speed could make a big difference, and the SABR community actually agrees, contrary to popular perception. If Alderson’s not on board with that, it’s because he’s stuck in the sabermetrics of 1995, rather than the advanced analysis of today. “Steals aren’t constructive or worth the risk” is the sort of over-general parody of SABR thinking that Ron and Keith litter the broadcast with. They have a bad habit of speaking as if every time a fielder is out of position it’s because some nerd with a computer forced him to be there. All the SABR folks do is relay the odds, and point out which odds you might not have expected. 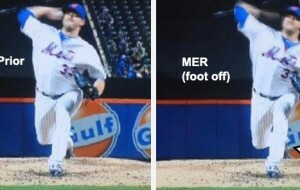 It’s not their fault if the Mets repeatedly shift without pitching to the shift. Want to stop giving up cheap hits through the shortstop hole when Cabrera’s playing behind second? Stop throwing fastballs away. The Pirates figured this out years ago. It really isn’t that complicated. But Terry Collins is likable in a way that faceless statisticians aren’t, so the stat guys take the fall on air. So, stolen bases. The SABR take on stolen bases is that there’s a break-even point, above and below which it’s either good or bad to attempt. 70% success rate? Ehn, could go either way. 60% success? You’re hurting the team, so stop. 80% success? Worth it! Keep it up! That’s the rule of thumb. But it’s just a rule of thumb. It doesn’t mean that anyone believes stolen base ability isn’t a useful tool to have for when you might need it. So, if Jose Reyes were to steal bases at a 75%+ success rate, and take more bases on hits and outs than the average runner, then SABR would duly recognize his contribution, and Alderson should too. I also think there’s value to distracting the pitcher, and although SABR hasn’t proven this to be true, they haven’t disproven it either. (They have disproven the “batter gets more fastballs with a basestealer on base” myth, though.) I’m also a big fan of evaluating plays in game context, and unlike hitting, which depends on the pitcher, a steal is one of the few plays the offense can initiate when it’s most beneficial for them to do so. (Sadly, I cannot back this up with numbers, as WPA doesn’t include baserunning yet.) So count me in the camp of thinking that speed could really help the Mets. That’s especially true if you consider the plodding players Reyes would likely be taking time from (like Flores). That’s like upgrading from Miggy to Trout. Also, Alderson’s “no way, Jose” was before he was released, which was a safe thing to say at the time, and a way to avoid a bidding war if his interest caused another team to be interested. Really the only risk is losing a player due to 40 man roster issues. It is hard to predict how diminished any individual 33 year old will be. We shall see, but it would be nice if Jose can get hit in the minors before he gets a shot with the big team. Yeah. And in familiar ways, too. Syndergaard took dominant stuff out to the mound against the Nats, and then — yech. Plawecki never hit, but I’m not happy to see d’Arnaud back behind the plate. I was about to rant about this, but then realized I already did, and the first rant applies to this latest Thor-Travis pairing pitch for pitch. I have an idea for Jeff – cut or trade De Aza ASAP. I realized tonight why I can’t stand him and no, its not the .163 average. I noticed for the first time watching tonight that he is wearing #16. That’s right, Da Aza is wearing Doc’s number. I think that time is now. Perhaps he is the hoodoo, having been rendered redundant when the Mets signed Cespedes. To me he always look like a sulking child who rarely smiles and even more rarely puts together a decent at bat. Gotta start somewhere, right fellas? Plus they can keep Reynolds when Jose comes up and stick him in the OF or wherever. Nimmo can play CF in a pinch. Perhaps they are waiting to see if King Lagares can come back? I see addition by subtraction and hope De Aza packs his bags soon – and leave’s Doc’s # on the way out.